Q. What's the best way to start planning a family reunion? A. The best way is to gather the family together and ask them what kind of activities they think all would enjoy. Q. 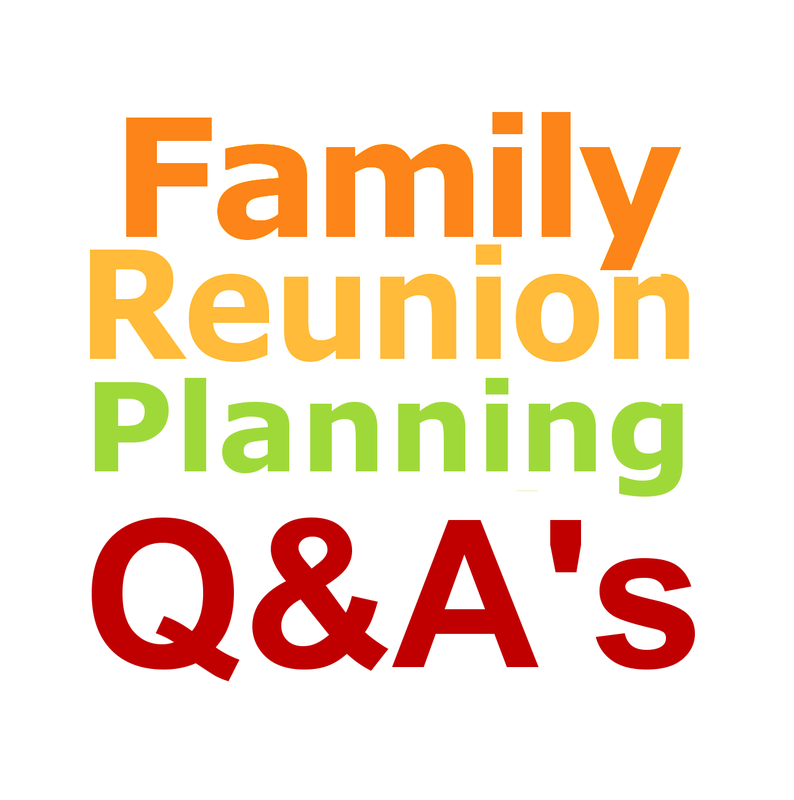 How much time does it take to plan a family reunion? A. That depends on the number of attendees, number of days the event will be held and the variety of activities. One day events held at a local venue or at home can be planned just a few months or weeks in advance. Q. What's the best time of year to throw a family reunion? A. Anytime accept winter time, unless you live in a very cold region year round. Most reunions are held late spring and summer while others are scheduled early fall. Q. What are the most popular outdoor reunion activities? A. Relay races, apple bobbing, softball, talent show, story telling, genealogy presentations, homestead town tour, grave viewing and picnic BBQ's are common reunion activities. Q. How many days should a reunion last? A. Most reunions last just one day while many are held over a long weekend and end on monday morning or around noon. Q. Is a family reunion committee really needed? A. If the event is to held over several days at a remote location and includes activities outside of the norm. Also if the group is rather large and duties vary a planning committee would be the wise, practical and economical approach. Q. What are some theme ideas ideal for such an event? A. Many themes center around the featured activities. These may include the following: Homestead and Genealogy Town Tour. Family Reunion Cruise Vacation. Family Cultural Food Fest or a Black Tie event. Q. Where can I get inspiring ideas to plan organize and manage my family reunion? A. Consider perusing the many articles on this blog. Make use of Fimark's Family Reunion Planner Keepsake Guidebook or use Fimark's Family Reunion Planner Social web app. Q. So exactly what can you do with Fimark's Family Reunion Planner Social web app? A. Fimark's Family Reunion Planner was designed primarily for the reunion planning committee and family historian orgenealogist. It's purpose was to provide the ideal venue for presenting family history and genealogy in a reunion event setting. The event planner has advanced to a complete 5 Themed reunion planner with many attractive features any individual reunion planner or event committee would consider essential. Q. Can you access Google Plus, Facebook and Skype conferencing via the web app? A. Yes. You can access all features of the two most popular social networks from within the app and hold event planning conferences. Q. What about the planning process? A. One of the most prominent features of the reunion planning app is the interactive step by step comprehensive event planning checklist which steps you through the entire reunion event planning process from planning, organizing and managing the event. Q. What about things like pre-written materials and supplies lists? Q. What about a lookup and search module for finding on location vendors, venues, entertainment and accommodations? Q. Can you review suggested activity ideas? A. The app provides several activity ideas complete with setup details and materials and need supplies. Q. Can you run reports? A. Yes. The app allows you to run survey reports and create a precalculated budget list. Q. Can you send out invitations? A. Absolutely. The program includes an invitation submission module for facebook users and templates for emailing or printing invitations as well. There's also a template for making family reunion keepsake memory booklets and you can access and print several beautifully written family reunion poems. Q. Can you print pre-written committee assignment sheets with prompts to followup in a practical and timely manner? A. Yes you can. Many of the committee materials are in document format and can be edited and printed. Q. What other features are included? A. The reunion planning eBook, T-shirt Designer app and Fundraiser app are also part of Fimark's Family Reunion Planning Social web app.